We’ll explore what terms like “National Populism,” its synonym “Populist Nationalism” (meaning simply Nationalist and not Elite) and “Deconstruction” could mean. We will base our findings on what we know about figures like Bannon, American history, and the current right-wing populist movements pervading the globe and waging war against liberalism and progressivism. We’ll use Bannon as an example or emblem that could just as well be replaced with Le Pen, Geert Wilders, or an ENF fascist. We aren’t picking on Bannon. Instead, we will look at the fascist symbolism and right-wing conformist and protectionist anti-elitism to understand what it means and why it matters in context. Here we must note that Nationalism is natural, normal, and good in moderation just like internationalism. Hitler and Mussolini drew large crowds in part due to the way that nationalism offers hope to a people downtrodden by the negative effects of social, economic, and political inequality in the liberal state. We should not fool ourselves into thinking “just because Hitler called himself a National Socialist” that the liberals can’t be fascist. That would be a misreading of the history of right-wing populism or what National Socialism means. Liberals can be fascist and socialist. If you don’t understand that, then you don’t know what is happening in 2017. Likewise, Nationalism isn’t just about xenophobia anymore than communism is about state control or liberalism about oligarchical inequality. All those are advents of unrestrained and untempered systems ignoring the warnings of Plato’s Republic. Consider learning about Hitler and Mussolini’s Populist Nationalist response to liberalism and Marxism to understand how right-wing populist ideologies arise in response to social, political, and economic inequality found in modern western global liberalism and socialism (AKA neoliberalism and progressivism). This is no different from the origin of liberalism or socialism. In fact, the story of each is the story of the other. Conservatism is about authority, tradition, hierarchy, and order. Liberalism is about liberty. Socialism is about equality. Fascism is about nationalism. You’ll understand that it is not the underlying virtues, but the extreme pitfalls of each ideology and the tyrants who wield one ideology to crush the others, that is at the core of our problems. A liberal socialist nationalist like Teddy Roosevelt knew this, but I wonder if it is known today. I question when I see the parties in their current form and read the quote below. NOTE: The points we make on this page are based on many sources. Direct evidence includes the CPAC speech of Bannon and Priebus (a transcript of can be read here). See the citations for more background on Bannon and his ideology. The American Republican Party, whether we are talking about Hamilton, or Lincoln, or Hoover, or Trump, has always been Nationalist, strict on immigration, and protectionist despite all its changes and changing factions. The Socially Conservative Democrats of old more inclined to deconstruction, but put that aside for a moment as that faction is today Republican. Specifically, the establishment conservative wing has always been this way (even when Henry A. Wallace hasn’t). The difference is that the Republican Party was almost never traditionally Populist outside of a few movements like the Know-Nothings, which are related and we will discuss. The pre-1920’s era and earlier Republicans favored aristocratic (and sometimes oligarchical) “New Nationalist” platforms with many socially liberal planks (this is still sometimes true, but has become less-and-less true over time). When the old Republicans went to Panama, they went (Monroe Doctrine in hand) to help ensure the Panamanians became free-trading Americans. They did not intend to purge Panama of our southern brethren based on religion or race. It isn’t that the Populist Know-Nothings didn’t beat up a few immigrants at the polls, or that America first didn’t tend to side with Hitler over Stalin. Even Ford pushed his workers to be American rather than pushed his workers out of America. Is our history’s foreign policy a spotless tale of sainthood? Not according to any reputable source I can find for either party, to say the least. But traditionally, mainstream (non-Know nothing) Republicans were more eager to Americanize “others” than to demonize them. This was even true for the group called Confederates. As the above alludes, there is a subtle difference between the old ways and new ways. Equally, there is a very real difference between the “Globalist McCain”(AKA traditional Establishment Republican) and “Nativist Nationalist Bannon” (A new type of Populist Nationalist Republican). The general idea we are discussing here is that this new form of Nationalism seems a bit more focused on an Aggressive Nativist message in the spirit of The Camp of the Saints, and less on an evolution of Tory-like protectionism (the opposite of Free Trade and the opposite of neoliberalism). Thus, this seems more toward European right-wing fascism than traditional mainstream conservative right Republicanism. We have an American microcosm of a global problem, which has grown out of our modern globalization and political, economic, and social inequality. The problem with a radical socially conservative or socially liberal response is the problem with WWII Fascists and Communists. It is the alienation of 1/2 of the country by the 1/3rd. Also, if we make “progressivism” and “neoliberalism” the enemy, and if we can tell our enemy by their religion or skin color, and if we make exclusive Nationalism the doctrine, it indirectly paints the Democratic Party as the enemy. Having one party as the enemy in a two party system is troublesome. If one has a nativist, nationalist, state against political, cultural, and economic globalization, that is ruled by one party they hardly have a Democratic Republic. One can always appreciate that Hitler and Stalin formed Workers’ parties. We look back on everything else less fondly. Their exclusive authoritarian ideologies and militaristic agenda are generally unpalatable in a democracy. TIP: This isn’t “about Bannon.” He happens to be articulating the ideology of the Le Pen, Brexit, global Nativist Nationalist right-wing movement better than others, and he is in power. This makes him a great example. I would suggest comparing Theodore Roosevelt, Eisenhower, McCain, and Bannon to get a sense of how all are or aren’t traditional Republicans. If you study those Republicans, past right-wing movements like Know-Nothings and America First, and the European fascists, then there won’t be many connections I can make for you that you can’t make yourself. TIP: See also the history of party switching in the U.S. (as it helps to explain how the Conservative coalition took control of the Republican Party with their Sixth Party Strategy and how their Populist Socially Conservative Wing came to power). See also Why Populism Is Replacing Conservatism, and Why It’s Winning from Breitbart.com. The citations below have links to more Nationalist Populist movements. In all cases, the term denotes policy based in right-wing “X country first” protectionism, nativism, nationalism, and xenophobia against globalization, socialization, and neoliberalism. In other words, it is essentially a synonym for right-wing populism (a sub-movement of right-wing conservatism). AKA, putting this politely as possible, at an extreme what one might call fascism. Bannon is pretty clear in his outward public message, so let’s consider that first. First and foremost, in Bannon’s words (see below), this is about economic globalization and deconstructing the neoliberal state. To what degree it is about pushing back against cultural and political globalization (AKA the social issues) is at least secondary, although it is often implied by the tone of the Republican Party, the Bannon Wing, Breitbart, and such implication is notably not “the same” as policy on paper or in action. The basics of neoliberal globalization vs. Nativist Protectionism aside, the specific language being used hints at a few darker things from our past (our American past and our global western past). In this sense, to what degree it would be appropriate to see nods to Communism as a red flag in America, it is rational to see nods to further right movements in this same light. Looking at this from a skeptical historical lens, the first thought that pops into one’s mind, if they know their American history, is that Bannon could be indirectly referring to undoing Reconstruction and implementing a liberal version of “America First” National Socialism. This Socialism would be replaced by Economic Nationalism and Economic Populism because the last thing a socially conservative populist wants is a progressive liberal populist socialist favoring some form of ideal Utopian Communism. Maybe I’m hearing a dog whistle that only a few are hearing. The other few seem to be on the far-right, which was for me the author one of the warning signs beyond my initial reaction to words. Maybe I see a symbolic shade in innocent symbolism, although I doubt this? I understand the different stances, but even with all that in mind, it seems odd to not react or say something when one hears echoes of the past like: “America First,” “Economic Nationalism,” “Deconstruction,” and “Nationalism” and “Populism” uttered in the same breath? Knowing what I know about the Street Smart American South and dog whistle politics, I’d assume that I’m not reading into this as much as just picking up on the code being put down (the point of dog whistling is that it is supposed to be plausibly deniable, so one can only muse). Assuming that I am on the right track and that the dog whistle wasn’t a consistent mistake, I’ll quickly explain National Populism and Deconstruction as I understand them from a Historical Perspective. First, I say “what do I know?” and “I could be wrong,” but, “liberalism and the First Amendment says that I get to make my point.” Second, in some alternative universe where Bernie Sanders won, and Keith Ellison was talking about “leading the Proletariat in a Socialist Revolution, Comrade,” I might just as easily be calling out that equal and opposite dog whistle acting as a siren’s call toward extremes. The point is about the dangers of extremes, dog whistle politics, and values that aren’t purely American values leaking in the sides. The point isn’t “to Demonize Bannon” or his ideology; just as it wouldn’t be to demonize the theoretical social liberal if the positions were reversed. Steve Bannon, Reince Priebus Interview at CPAC 2017 | ABC News. To be clear I’m commenting on Bannon’s words. I’ve listened to him before. He is smart; he is also a socially conservative anti-establishment right-winger. 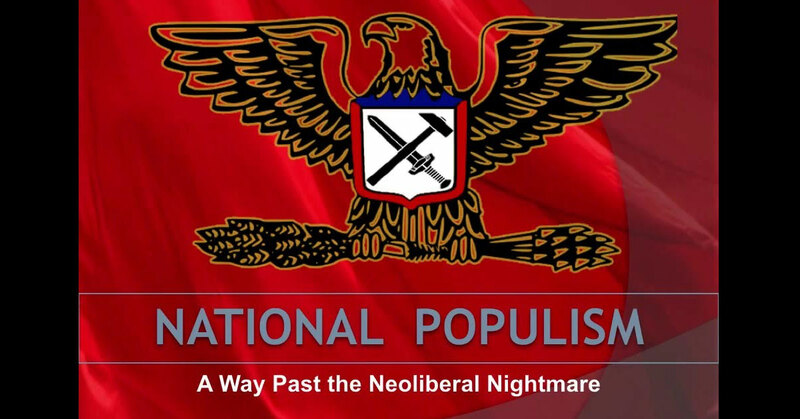 Now that we have the basics down, and we have noted some complexities, let’s look closer at what a National Populists and Economic Nationalist deconstruction agenda to see if and how it is like past right-wing movements and if and how it goes beyond the usual American position. By understanding how it is like past right-wing movements we can see pitfalls that even the current purveyors of this Neo-Nationalism might be missing. This can help us to see how and if aspects of this ideology fit with Americanism and how and if some aspects don’t or could be seen as aggressive toward the left and center. National Populism AKA Right-Wing Populism is, at a worst, a nod to America First, Fascism, National Socialism, Anti-Globalism, the Alt-Right, and the general socially conservative right-wing machine. From this perspective, and as far as I can tell from Bannon’s perspective, means Not Globalist and Not Establishment. It describes an opposition to an economic agenda on the one hand (a nativist protectionist opposition to a neoliberal agenda), but also likely speaks to the cultural and immigration aspects of globalism (opposition to cultural and political integration between nations). It is not neoliberal global Clinton or McCain neocon globalist, and if Bernie was in power, we could also say it isn’t Socialism either. It is more a new-populist faction that arose out of the Sixth Party System push-back against the global left, a movement that as a whole is symbolized by Fox News and Right-Wing radio, but as a sub-movement is symbolized more by “the alt-right” and Breitbart. If the only choices were Globalist Liberal, Globalist Socialist, and National Populist. Then the Confederates, NAZIs, Mussolini’s Fascist Republicans, Breitbart, Alt-right, Trump, Bannon, Hannity, and all forms of ideologies that want to “Build a Wall” and get the “others out” would be in the National Populist camp. The more nuance we employ, the less we have to clump Trump, Bannon, and Hannity. Certainly, we can put more distance between Bannon and NAZIism or Mussolini’s fascism if you want to keep it simple and ignore the socialist aspects of the NAZIs. I think we can toss the old “every Republican is a greedy fascist and racist” line out. Historically, the term that describes this “X country first” nationalism is fascism. This is even true for Hitler despite the oddly inaccurate as time went along Socialist Workers’ namesake. In WWII there were two extreme ideologies, one left and one right, one was fascism, and one was communism. Like slavery in the American South, no one wants to be associated with them politically today, but the reality is that, in their day, people were. One way to understand this is to understand this all is by considering the Conservative Coalition. That coalition describes the “big tent” of social conservative ideologies that forms the modern right-wing. It is a mix of natural right-wing positions. Some positions are born from being like an animal trapped in a corner by the modernizing global left, and some positions are more born from common positions one can take over any single voter issue. The Red team thinks we need more funding for X; the Blue team thinks we need less. One takes either a conservative or progressive position on an issue. There is only one set of facts, but always at least two informed opinions on that set of facts if not more. The problem is in creating identities out of one of the two positions and being aggressive toward the other position. It is the lesson of extremes from WWII again. I don’t want to get bogged down here, as the above is probably enough to frame the concept. The concept being that: one can take a natural socially conservative position on something, but when that position is made into an ideology, and that ideology forms around being in opposition to the other position, it can be a slippery slope toward past unsettling right-wing movements. Authoritative ideologies are very different from non-authoritative ones, and this is especially true of fringe ideologies like Communism and Fascism. Authoritative fascism is not the same as non-authoritative democratic right-wing-ism that pushes toward a slightly fascist ideology. Likewise, I would say that National Populism has not yet become overly tyrannical or authoritative. There has been no night of the long knives or fire decree, but of course one has to speak before there is, not after, even at the risk of being verbose. TIP: The main problem here is that I can say “this isn’t a big deal.” Trump can say “America first just means I love America.” However, when the identitarians hear the dog whistle, and I hear the dog whistle, we move beyond this being something that doesn’t need to be said. Someone decided to make the video below around the time that it became appropriate to write long-winded essays on the dangers of the fringe ideologies of social conservatism and their corrosive effect on a Democratically-minded Republic. National Populism — An Introduction. The thing I love about identitarians (like identity and aryan) like Richard Spencer is that they quickly pick up on dog whistles and embrace ideologies. Here are another person’s thoughts on national populism that helps to prove my point. TIP: Some on the right call Bernie and the Global left “Communist.” Is that right? No, it isn’t. It is the same for libertarians. They get called anarchists. Is that fully correct? No, it isn’t. They called both Reagan and Bush fascists. Is that right? Probably not. Those terms evoke valid symbolism, but they aren’t “correct.” However, the more extreme and authoritative an ideology gets, the more those terms make sense. So after what was perceived by the left as the Muslim ban, and with the wall construction beginning, weight goes to using the term fascist to describe some of the right-wing agenda. If Bernie was in power and he started socializing things, we might hear the right call him a Communist. We might then discuss whether he was and wasn’t being like this. In both cases, calling out the extreme left and right is the American thing to do in defense of the liberal values that all Americans are implicitly sworn to defend under the implicit and explicit American social contract. In other words, we have a toe or two in nationalism here, and a toe or two in populism there, and some waiting in the wings are flirting with Socialism. In my opinion, nothing has gone out of the bounds of a past administration like for instance Teddy Roosevelt’s. If it is going to stay in those bounds, then we can have tolerance, not need censorship, and have room for centered discussion. However, we have to watch out for the slippery slope. Today we dip one toe in incorrectness; tomorrow we are swimming in incorrectness, drowning in it, up to our neck. We don’t want that. Deconstruction is another term used by Bannon. For our purposes we can relate to Jeff Sessions. Since it is appropriate to acknowledge here, Sessions is another very impressive and smart person who just happens to ideologically be in the camp we want to discuss. Deconstruction gives a nod to shifting power back to the states and the people to move forward with the sort of nationalist agenda that we described above. So, this can be good and pure States’ Rights federalism, something that most people favor over big central government on many issues but the wording conjures up some dark images from the past that should be discussed. Historically the Solid Conservative South was Democrat, in the days of Reconstruction the Northern establishment sent the military to occupy the South and force integration (“Military Reconstruction“). The south got over it… never, and here we are. I am not tending to hyperbole here; that is one key at the center of American politics. Deconstruction isn’t just about pushing for States’ Rights federalism, instead, looking to our past, it is sometimes about less savory things like undoing regulation like voter protections at the state level, while at the same time forcing the prohibition of marijuana at the Federal Level. We can see this through a Centered Economic Nationalist lens and say this is purely about undoing some bureaucracy. We can see it as aggression toward the left by a forced takedown of a neoliberal state. We can see this through a social lens as a general nod to the deconstruction social programs passed by FDR and LBJ. We can consider the main goal of the Sixth Party conservative coalition strategy to be a pushback against Communism and the social policies of figures like FDR and LBJ. In that case, it isn’t unreasonable to see a term like “Deconstruction” as a dog whistle that invokes thoughts of both Reconstruction, the Safety Net, and general neoliberal globalism. How else are we supposed to react to terms like “the Deconstruction of a neoliberal administrative state.” If it isn’t meant to be aggressive, feel free to tell us, but better yet, SHOW US. Nothing will shut a liberal up faster than great policy. Likewise, nothing will open up the flood gates more than a policy that aggressively deconstructions and alienates. The Bannon wing was created by political frustrations and inequalities. Aggressive and authoritative action from that stance will cause an equal and opposite reaction. This is how and why the pendulum swings. TIP: For most of history people like Sessions and people like Bernie Sanders were in the same party, they were a “populist” party of conservatives and liberals we call Democrats. Since the 1960’s people like Jeff Sessions have joined the Republicans and formed a Conservative Coalition to opposed New Deal Democrats. So much changed, but core ideologies didn’t change. Now the Democrats like Bernie want States’ Rights for social justice and Sessions wants to restrict voting rights and tell people what they can put in their body and do with their bodies and what they can’t. You can see why their spiritual ancestors teamed up on states’ rights before and why they would be so opposed now. Hillary Clinton said something bizarre in the 1990’s; she warned of a “vast right-wing conspiracy,” digging into things, she was giving a snarky name to the coalition of social and business-minded conservatives that banded together after FDR and LBJ to push back against progressive policies. Again, although I’m sure I’ve already lost many readers, I’ll point out that “a coalition of conservatives” isn’t a bad thing or good thing. It is just a statement about the political coalition that forms the modern Republican Party. There is an equal and opposite coalition of socially liberal and business-minded Democrats. From this perspective “taking down the neoliberals and safety net” is akin to Bernie being like “we are going to take down the Neocons and Tea Party.” One side sees it as “finally we are safe again” and the other side sees “terror and aggression against everything we stand for.” Unless we want 60 million panicked citizens, we “have to” lead from the center even when America votes in a non-center ideology into power. The Conservative Coalition has risen before, in the Nixon and Reagan eras, and under the Second Bush, but this time it is a bit different. This time the populist, not establishment wing is leading in some respects. Although I’m sure, many hope they can stick it to the establishment and do some good for the people, the worry with the populists is that we get a sort of Jacobin overreaction that is destabilizing to the state. The Economic National Populists won a Democratic election on a Deconstruction message, and now they are in power, along side many traditional and centered allies, in a BIG TENT of different positions on different social issues. That is fair. If Bernie/or William Jennings Bryan was President, and they started saying “we are implementing International Leninism” and we are going to Radically Reform the American South, force integration, funnel power away from the states, and ensure a global nation, then the right-wing would have some valid worries. Sure, the right-wing may have told itself that this is what Obama and Clinton were doing, or what FDR and LBJ did, and they may not be fully wrong but, two wrongs don’t make a right (pun?). I could keep discussing nuances or relating this back to Bernie, but the bottom line here is that: Fascism and Communism have no place in America, they never did. We can take progressive and conservative positions, and we can stick it to the establishment when things get out of hand, or simplify things when they get too bureaucratic, but we can’t just undo FDR and LBJ without a ton of aggression toward tens of millions who identify as left. Pushing towards this with terms reminiscent of past fascist ideologies is a strange red flag and not helping. Fringe far-left and far-right supporters of authoritarian ideologies have no place usurping our democratic, republican, and liberal values. The right-wing seems to see that Communism is clearly wrong, but I feel that they don’t fully understand the other lesson of WWII, that Fascism is also wrong. 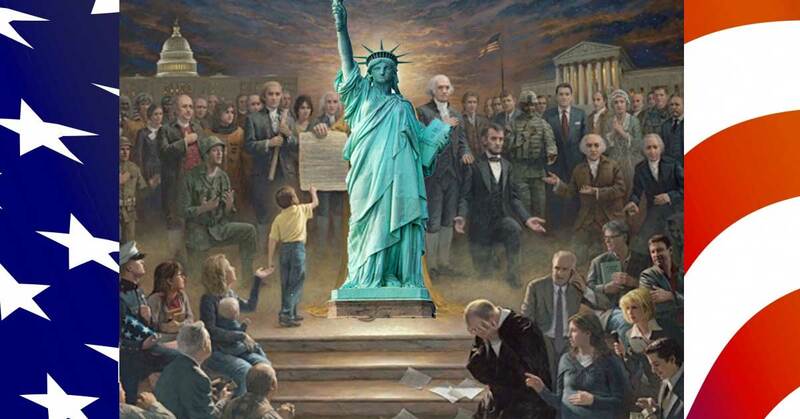 We all want what we want, and we haven’t agreed on much since 1776, but what we do all agree on is coming together using our reason to ensure just laws in the spirit of American democracy and republicanism. Factions change and the pendulum swings, and we would all be wise to remember that when one side seems to have unlimited power. To whatever extent the American South felt oppressed under the Radical Republicans, or to what extent right-wingers felt repressed under FDR or LBJ, or to what extent some felt Obama was pulling America toward a globalist liberal agenda and only Fox News and Talk radio could fight back, let that stand as a symbol of what the left feels when we hear terms like National Populism, Deconstruction, Build a Wall, Ban Muslims, etc. I don’t expect everyone to agree, but I do expect enough empathy and respect for our country to roll back the rhetoric and focus on the bigger picture. The sad thing here is that, while I may get slammed for writing this, I think the worst thing that can happen is for the “populist Second American Revolution” that just occurred is to have the pendulum swing at it. You are in power, use that power for the forces of good and earn yourself a seat at the table so we can avoid another cycle of repression and rebellion. Does that make sense? History is a good “what does and doesn’t work” guide here. All the above said when politicians in control of the Government say “Law and Order,” “Deconstruction,” and “National Populism” not everyone is going to get it, but here in the internet age enough will to make this a dangerous game of linguistics. Fox News Has Ruined An Entire Generation with Their Hate and Ignorance. You can see how the propaganda war gets heated, the left and right radicalize, and then Communists and Fascists arise. These are naturally occurring phenomena that take conscious effort to prevent. America is for me like Athena, meant to protect against this at all costs. Let us remember, it is only Trump and Obama, we don’t need to go full tilt here, but this language is feeling really slippery, and the thing is, for me, I think Bannon is smart enough to know most of this. This also means he is smart enough to curb it before it gets more out of hand than it is. If anti-establishment just means anti-liberal, then that is going to be a hard ideological war to win, historically it has never worked out well.